In the absence of government economic data, there aren't many talking points. The U.S. government was able to release the weekly jobless claims data, but we will be lucky to get much else out of them for the foreseeable future. As you likely know by now, tomorrow's employment report has been canceled (or at least postponed). For now, the markets are forced to focus on second tier data for guidance. This morning we learned that the ISM Services index dropped to 54.4; what would normally be a non-event seemed to press already shaky equity prices lower. Tomorrow will be data free, so all eyes will be on political headlines; nothing good can come of such an environment. German Bund yields are on the rise (prices are falling), and that appears to be another factor weighing on U.S. Treasuries. Anyone that has traded bonds and notes in the last decade would likely tell you that the current rally lacks the volatility that is typically seen. There are two ways to look at this; either the rally is a head fake in a longer term downtrend, or there is plenty of room for prices to run higher. At the moment, we are cautiously leaning toward the later scenario. We believe there are likely buy stop orders above 134; if they are triggered, we could see a sharp wave of short squeezing. We'll admit we thought a government shutdown would lure more buying (or short covering) in the Treasury market. However, the flight to quality bids are being canceled out by those that fear this shutdown will get out of hand. Simply put, there is some concern the U.S. government will default on its debt obligations, which makes Treasuries less valuable. We doubt it will come to that. Even the credit default swaps are pricing in the odds of such as next to nothing. However, markets trade on emotion not logic. **Consensus:** We STILL think the December ZB is shooting for 134'25 (about 127'12 in the note)...but the suspense is killing us! The gap fill rally failed...1655ish next? As markets tend to do, the ES filled a left on the Sunday night open. The gap was officially filled in the mid-1680s but managed to squeeze a few extra traders out of the market with prints into the low 1690s. Nonetheless, the rally eventually fizzled. It feels like prices should continue to move lower into the mid 1650s (trend line support). However, this is a traders market in that you can't get too comfortable with your shorts. There will be big bounces, and traders should always look to offset bearish trades into the dips. 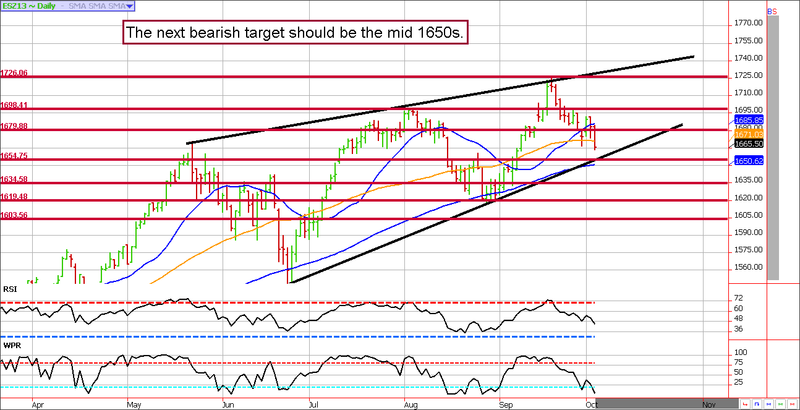 If you are a bull, you can start to look for opportunities in the 1650s. With that said, even with prices at such levels, we have a hard time being comfortably bullish but it would certainly be a price for position trading bears to lock in profits and move to the sidelines, or at least protect their position with stops or options. 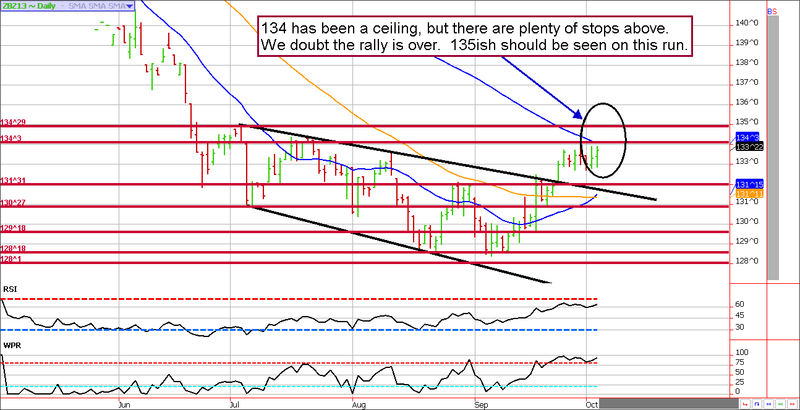 **Consensus:** The chart suggests that post-gap fill selling should seek 1655ish in the coming day or so. At this price, we turn from bearish to neutral to reassess the situation. September 19 - Buy a December dollar index futures contract (near 80.35) and a November 80 put option. The total risk on the trade is about $900 plus transaction costs. The profit potential is theoretically unlimited. We are looking for a bounce into the 81.70 area. September 27 - Buy e-mini Natural gas futures near $3.54. The mini contract makes or loses $25 per penny, so it is far more manageable than the full-sized contract and carries a margin requirement less than $1,000. October 2 - Buy a December corn futures contract near $4.40 (preferably using minis for most retail accounts). The plan is to add on at lower levels if seen.